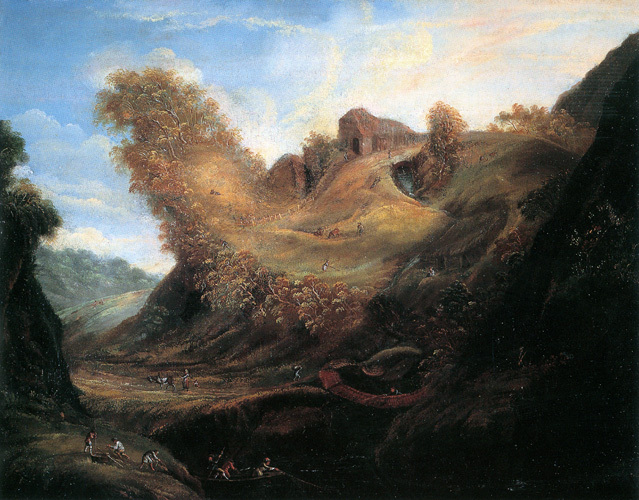 He is described as a '16th century Mannerist' and the 'Grandfather of Surrealism'. However, I am looking for a more specific term used to describe this type of painting where subjects are composed of other objects upon closer inspection so that I hopefully take a look at other paintings in this style. An analogy would be how cubism was an offshoot of 3-dimensional art form and later became its own art movement. The style of the elements of his paintings is mannerist, mannerism being an epoch of transition between renaissance and baroque. However, what we see in his most famous paintings is much more a matter of perception and less about the style or epoch but completely different categorisations. His famous fruit face composite heads are visual jokes, more or less "hidden faces", in technically often an allegorically glorious mash-up combination of still life and portrait. He tickles our joyous nerves for optical illusions that works especially well for our human pattern recognition circuits calibrated for faces, pareiodolia. 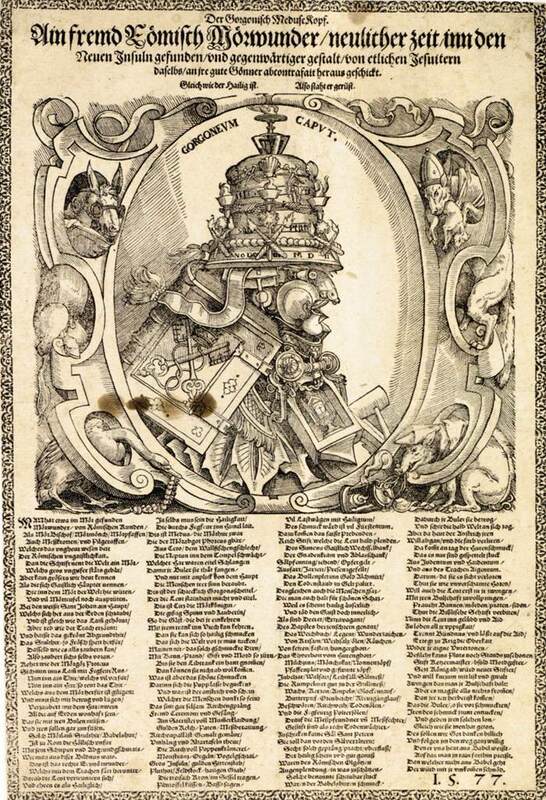 Some more artists that dabbled with this, albeit not in this volume, and mostly not as "in-your-face" with it, but sometimes earlier than Arcimboldo were Leonardo da Vinci, Albrecht Dürer, Tobias Stimmer, Hans Holbein the Younger, Matthäus Merian, Anna Maria Sibylla Merian, Marcus Gheeraerts the Elder, Wenzel Hollar, Josse de Momper. Acrimboldo's influence extends to defining ambiguous images, reverse images, and much later vexierbilder and surrealist paintings and op-art. A list of reversible figures on Wikipedia. 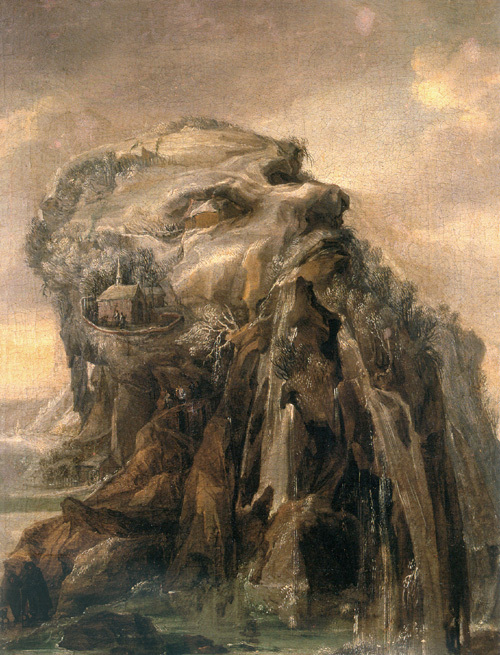 Joos de Momper II: "Allegorie des Winters" 17th cent. In: L' homme-paysage, p 63. Matthäus Merian: "Campus Anthropomorphus", In: Athanasius Kircher, Ars magna lucis et umbrae, 1646. 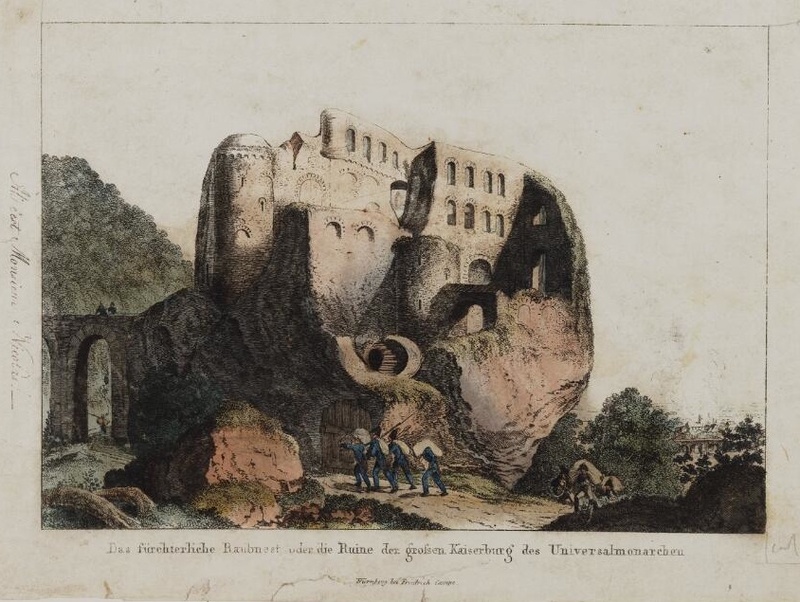 In: L' homme-paysage (siehe Literatur), p 16. 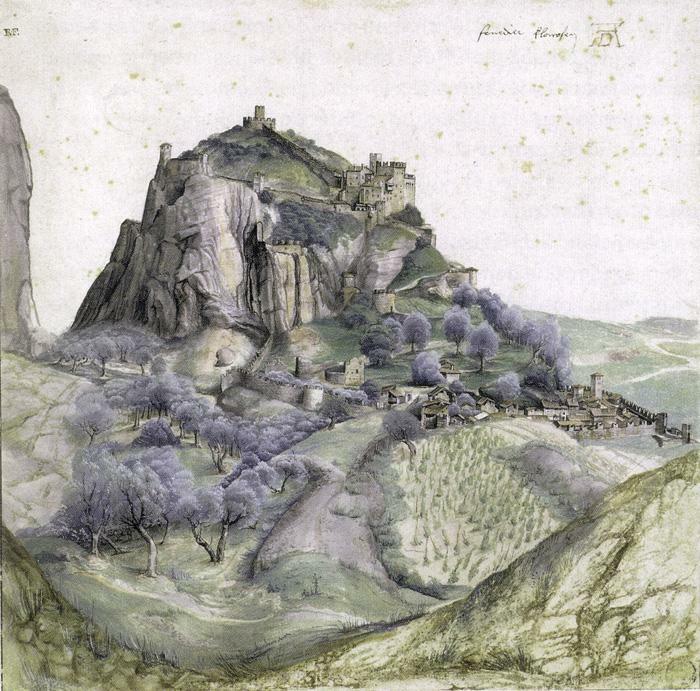 Albrecht Dürer, Aquarell bez. „der fenedier clauwsen“, 1495. 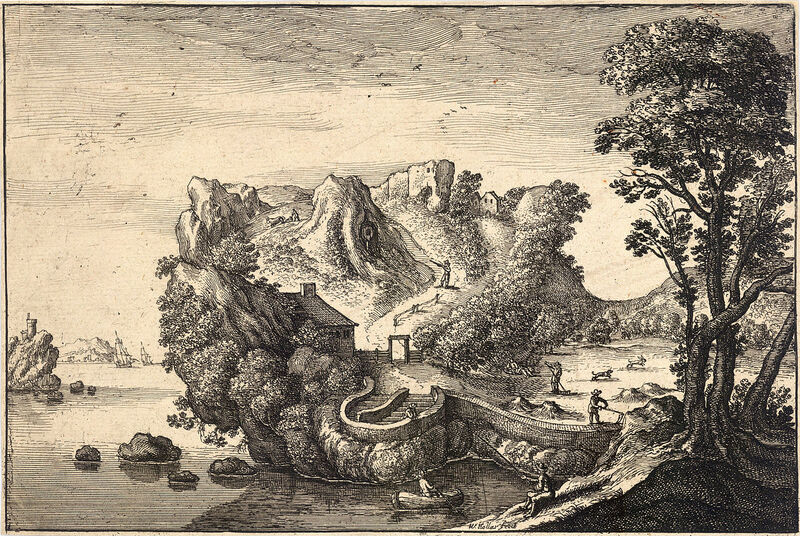 In: L' homme-paysage, S. 54. 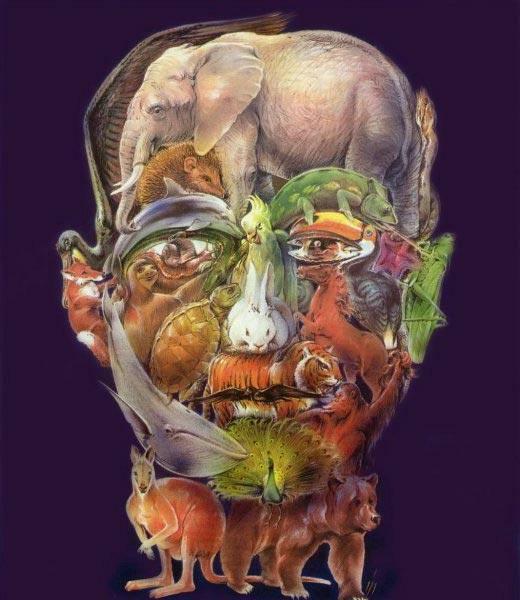 Thomas DaCosta Kaufmann: "Arcimboldo: Visual Jokes, Natural History, and Still-Life Painting", University of Chicago Press: Chicago, London, 2009. 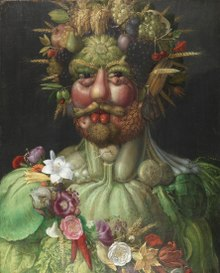 In addition to the styles you mentioned, these works of Arcimboldo are "composite portraits" or "composite heads" prefiguring techniques like collage, combination printing, and mashup. Viewers experience pareidolia as the assemblages seem plausible as wholes, though their abstraction is clearly visible. 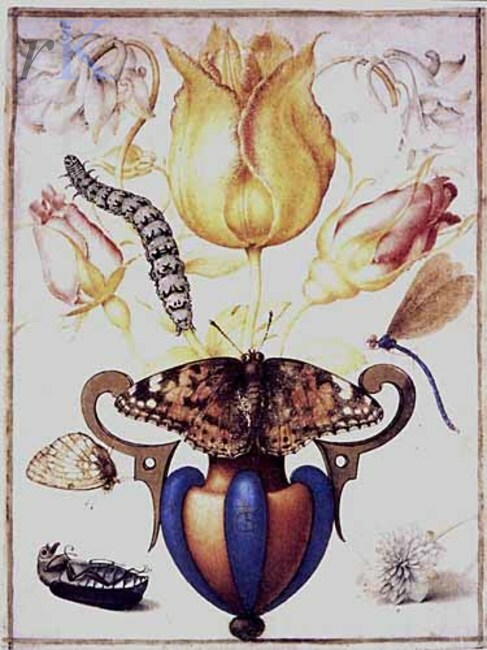 According to María Victoria García-Serrano, Arcimboldo also used the illusion of depth, trompe l'oeil. I don't think Art Historians have come up with a definitive term for it, because those works of his were fairly unique for his time. They appear to consider him part of the Mannerist movement based on not just the works you are asking about, but on his other, er... non-flora-based works, and the evolution of that work over time. 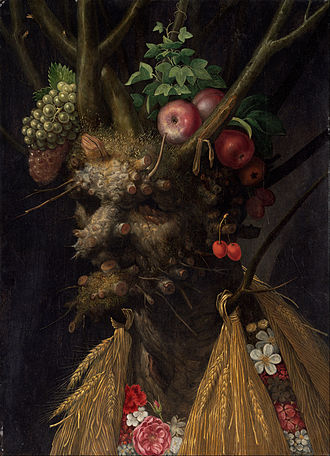 So its probably reasonable to call Arcimboldo himself a mannerist, while the term remains inadequate as a descriptor for the works of his you are particularly interested in. If he'd been working in the early 20th Century rather than the 17th, I think it would be perfectly reasonable to call him a Surrealist. But that's a movement with its own history (and sometimes associated philosophy), most of which he predated. So I suppose you could call it surrealistic, but calling it Surrealism or calling Arcimboldo a Surrealist would be an anachronism. Also, as you point out, Surrealism is a very broad category, and you're primarily interested in the one presentation technique he used. The closest equivalents I can think of for the technique are Pointillism and Divisionalisim. In both cases the artist is making a portrait that looks normal at a distance, but upon closer inspection is made up not of strokes and coherent areas of paint, but of other objects. However, for Pointillists it is usually dots, for Divisionalists dots or small areas (almost like a mosaic), while for Arcimboldo it was representations of seemingly unrelated physical objects. 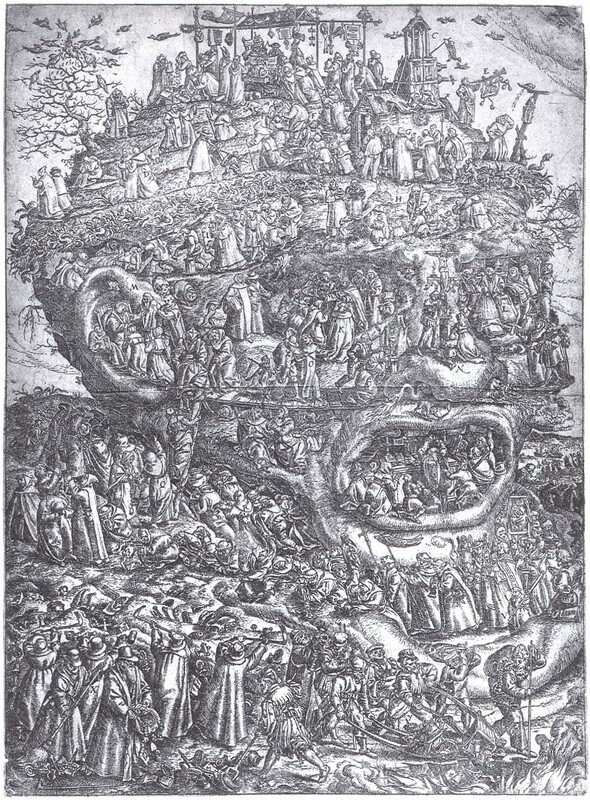 Also of course Pointillism and Divisionalisim developed from Impressionism, and once again Arcimboldo predated that.